Hi and welcome to celtichound collars. 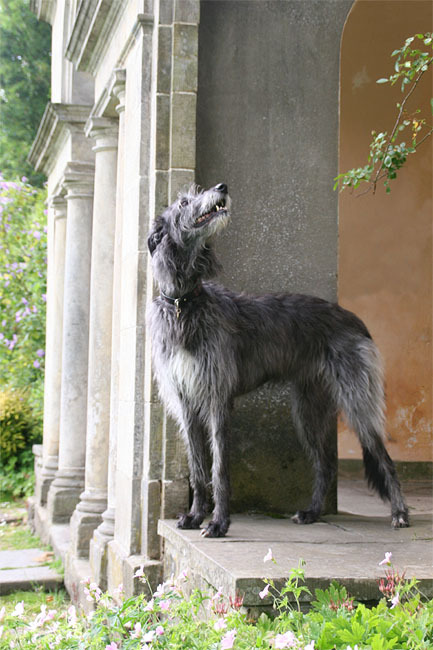 I am Tara and as I am half Scottish deerhound and half Irish wolfhound I am the original celtichound. 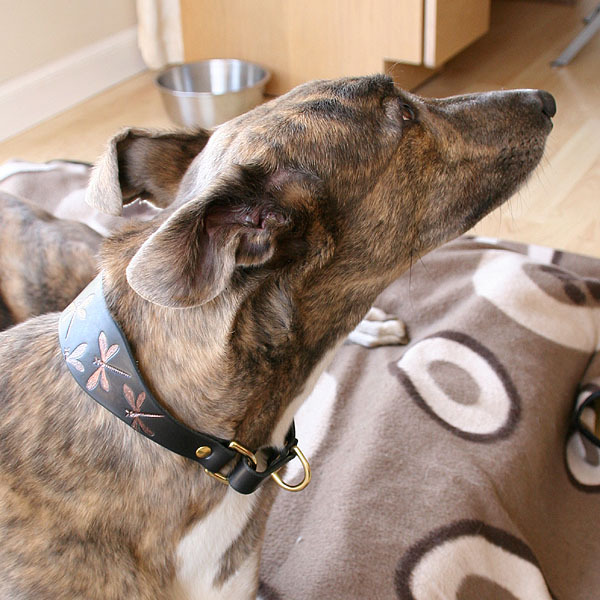 My human mum makes collars and I am going to tell you a bit about them and keep you up to date on what is going on. 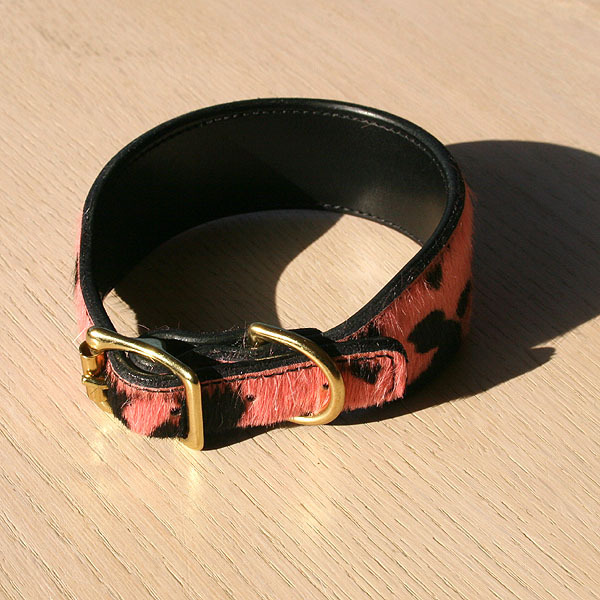 Mum makes these hand made leather collars and leads. 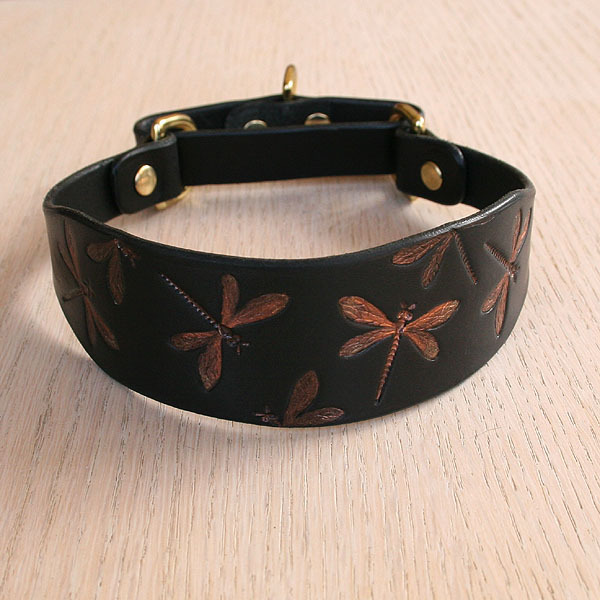 She decided to start making them as she felt that there was a lack of leather collars with nice decoration for us hounds who like our collars. 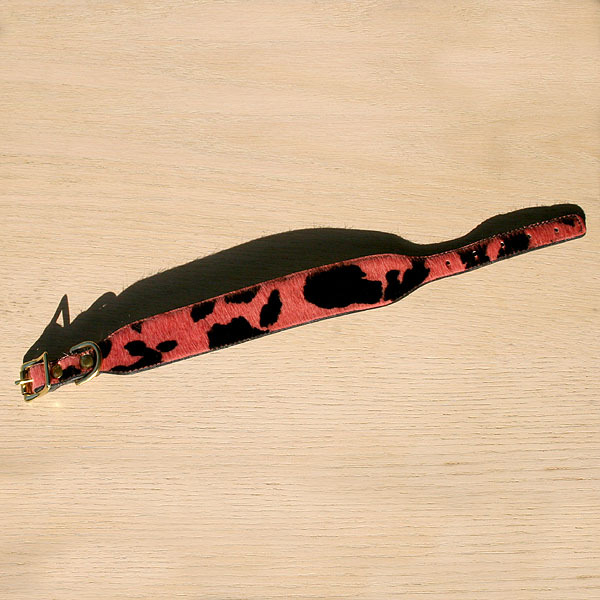 They are made from veg tan bridal leather with rounded edges. 10% of the sale price will be donated to a charity, we are currently donating to GAP, Lurcher Link, SGS and G4U but would be willing to help other charities as well. Mum can also do linings in sheepskin and suede. I think that she will be offering more colours in the suede but is still waiting on samples to arrive to see the colours. Mum has created a new style of collar with attached hearts and stars. 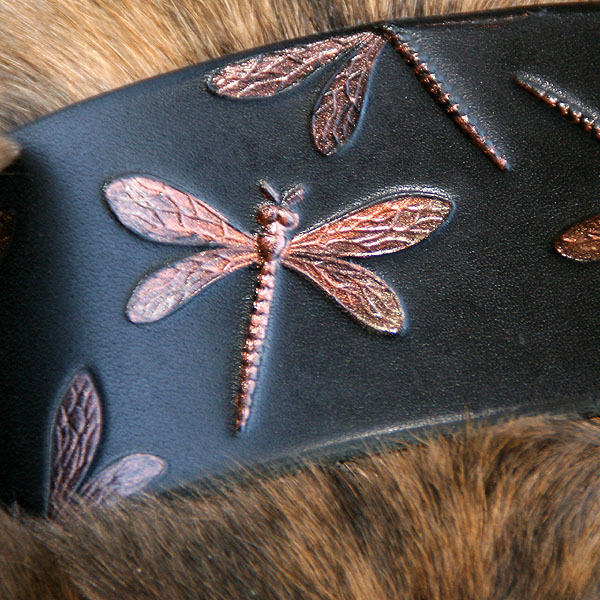 Zak, who is my brother, got a lovely dragonflies collar. Me jealous never! Mum decided to do a test to see if she could do a more standard style martingale collar. 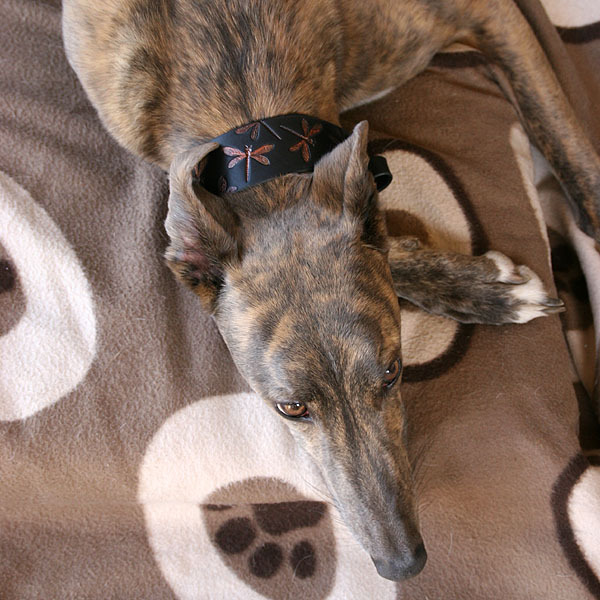 As Zak really liked the dragonflies fabric martingale mum made for him she decided to use a similar design. It started off as a long loop martingale with a slide (based on some slip collar leads that mum made for Brin�s mum). 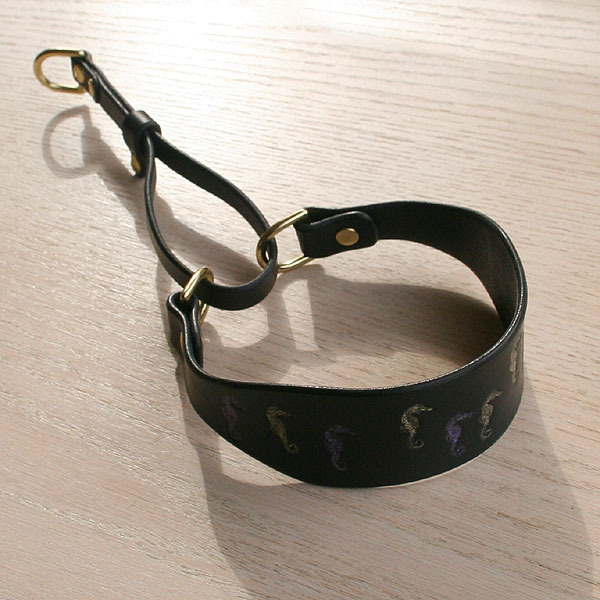 Mum says that this is great for people who just slip a collar on to walk the dog and either don't let the dog off the lead or have a separate tag collar on and take the martingale off to let the dog run around. Otherwise the long loop hangs down and is too impractical. As Zak pulls a lot mum made the martingale bit wider than on the first test and this does sit a bit stiff so for a dog that didn't pull lots mum said she would make it the same width as the first test, though I think that with wear this should soften a bit. 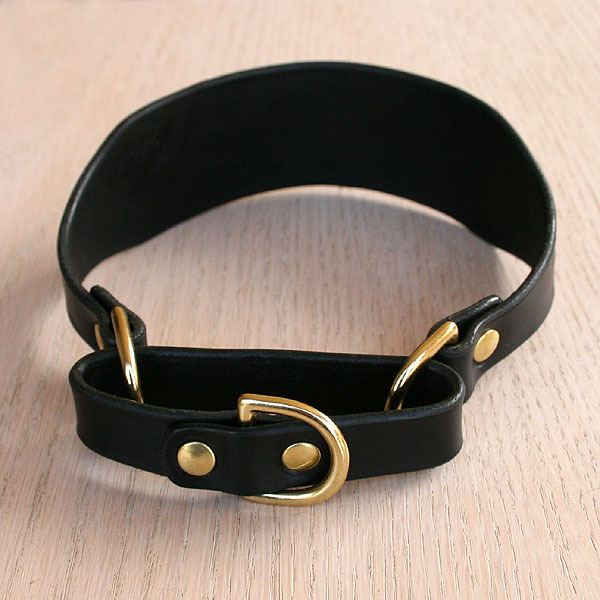 The main drawback of the latest design is that it needs reasonably good measurements as it is not adjustable and you wouldn�t want a collar that didn�t fit over your head. 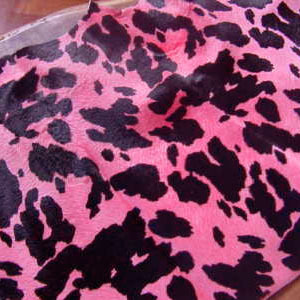 So mum managed to buy some outrageous shocking pink and black hair on leather and will be making a small amount of collars in this if there is any interest. The collars she can do so far are buckle collars with a layer of bridal leather on the inside to give strength and a layer of hair on hide on the outside for the look. Due to the thickness this gives they can't be lined but the inner layer has the smooth side of the leather so should be smooth against the neck. Mum should also be able to do slip collars in this style. One point to note is that hair on hide will eventually shed especially in buckle areas as the hair gets rubbed off.